FlexGel® is an innovative solution to a common problem: corrosion damage to pipelines or conductors within the confines of guide tubes. FlexGel® is deployed when corrosion is prevalent within a Guide-Tube. The gel displaces any sea water and removes oxygenated water within a splash zone environment. In doing so, the gel reduces any further corrosion in the structural tensile armour wires of the flexible pipe or pipewall in a rigid riser, thus increasing its life. FlexGel® can also be installed just after riser pull-in as a preventative solution. FlexGel® is an environmentally friendly product and is CEFAS-registered. FlexGel® is easily deployed from the asset’s topsides to displace sea water from the splash zone region. It effectively removes the air/seawater interface at the splash zone which is the cause of many integrity concerns. FlexGel® is available in a variety of viscosities, specific gravities and consistencies, designed to form part of an engineered solution specific to your corrosion concern. Flexlife has also developed a specific FlexGel® product to address the thorny issue of mitigating corrosion within the confines of topsides pipeline trunion supports. An UK based operator had concerns about coating disbondment on two steel risers within a J-tube. 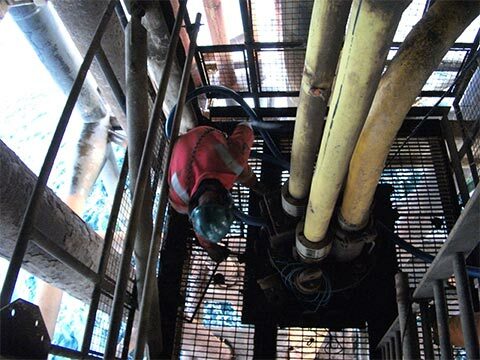 Previously, the water injection riser had suffered catastrophic failureand real concern existed about the integrity of the adjacent safety-critical gas-lift riser. Flexlife deployed 5,600 litres of FlexGel® to displace a column of water from around the area of concern. FlexGel® is immiscible in water and its specific gravity can be adjusted depending on the application. For this application the FlexGel® was supplied with a lower specific gravity than that of seawater to displace water at MSL to prevent further oxygen ingress into the area of concern. The completion of the scope of work demonstrated that FlexGel® can be remotely mixed onshore, delivered in appropriately selected containersand successfully deployed into a J-tube using air driven double diaphragm pumps interconnected with hoses. The customer was saved significant Capex by not having to replace the gas-lift riser. Subsequent In-line inspection 3 years later confirmed that the pipe wall thickness had been preserved, thus proving the effectiveness of this solution.